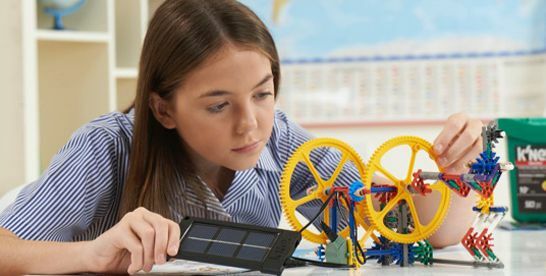 Teaching students to build simple machines is an important part of the Science, Technology, Engineering, Art, & Math (STEAM) curriculum and the maker classroom. K’Nex provides students with the building blocks to let their imaginations soar. This kit includes an educational guide for teachers to get lesson ideas for their classes. Students investigate wheels, axles, and inclined planes. This set allows kids to work as a team, fostering collaboration among students. While this set provides instructions for 7 projects, the possibilities are only limited by the child’s imagination. Encourage their own adaptation of the project or help them to use their project to connect with real world applications. Here’s the link to the digital lesson plan that goes with this K’Nex kit. Click here for more details.